Use your conversations inbox to manage your team's email and chat conversations in one centralized inbox. 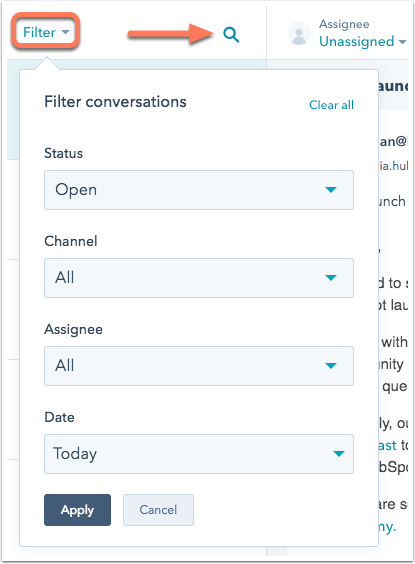 Incoming conversations can be automatically assigned to paid Sales Hub and Service Hub users, but free users can still assign and respond to unassigned conversations as long as they are included as a team member on the inbox. If a user has Admin or Super Admin permissions, they are able to view any conversations inbox in the portal. Admins and Super Admins cannot take actions in the inbox (such as assigning a conversation or replying to a thread) unless they are included as a team member in the inbox settings. Status: indicates whether a conversation is Open or Closed. Filter your conversations based on their open or closed status. Channel: specifies which channel the conversation originated in. Sort conversations based on whether they were created through Chat, over Email, or select to view All. Assignee: indicates the user assigned to the conversation. Filter conversations by a specific team member. Date: filter conversations that took place over a specific time range. All conversations: view all your team's conversations in the inbox. Assigned to me: view all conversations that are routed or assigned to you. Unassigned conversations: view all conversations that have not been assigned to an owner. Email: view all conversations that originated from your team's email inbox. Chat: view all conversations that originated from a chat widget on your site. Bots: view all bot conversations that were never or have not yet been assigned to an owner. Filtered: view all emails that are not relevant to your business conversations, such as promotional emails. Any emails received from a role-based email (marketing@, sales@, etc.) will be sent to the Filtered view instead of the general Inbox. Trash: view all deleted conversations. Open a deleted conversation to review the content. If you want to restore the deleted conversation, click Restore rotatei in the top menu. To permanently delete the message, click Delete forever delete. 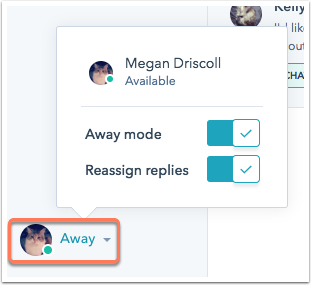 Above the filters, click Compose to write an outgoing email directly from your conversations inbox. Learn more about sending and replying to emails from the conversations inbox. The name of the contact who started the conversation. The email subject line or a preview of the chat transcript. The timestamp of when the email or chat was opened. A label to indicate if the conversation is from a Chat or Email channel. Next to your list of conversations is a detailed view of the selected conversation from your inbox. To select a user to assign the conversation to, click the Assignee dropdown menu. To delete the conversation, block a sender, or mark the conversation as spam, click the More dropdown menu. Please note: if you mark an email conversation as spam, this will filter the current thread only. Learn more about blocking senders. To mark the conversation as closed, click success Mark as closed. In the reply editor at the bottom of the conversation, you can reply to incoming emails or live chat with your website visitors. If you want more space to respond to the conversation, you can collapse the right or left panel by clicking the last icon at the top of the panel, and expand the panel again by clicking the first icon. Please note: in bot conversations where the visitor has not reached the bot's Agent handoff action, the conversation cannot be marked as closed until after 30 minutes of visitor inactivity. The right panel shows you full details of the contact record associated with your selected conversation. To open a contact record in a new browser tab, click the name of the contact. To create a new ticket associated with the contact, click Create ticket. Email: send a one-to-one email. Add note: add a note to the record. Create task: create a task for the record. Send meeting invite: schedule a meeting with the contact. Disassociate Contact: remove the association between the contact and the live chat thread. Create deal: create a deal. Block sender: block a sender from future interactions with the channel. The conversation will move to your Filtered view in your inbox. You can choose to unblock a sender from your Filtered view so future conversations are visible in your inbox. For chats, moving forward, the visitor will see the chat widget when they visit your site, but their new messages will not appear in your inbox. For emails, this will filter the thread and all incoming threads from this sender moving forward. In the About section, view important information about the contact you are conversing with. You can also view any existing deal, ticket, or company associations, as well as a history of previous conversations with this contact. Away mode: use this setting to indicate whether you're active or away for incoming conversations. When you click to toggle the Away mode switch on, you will still appear available for any open chats currently assigned to you, while appearing away to new incoming visitors. Reassign replies: use this setting to reassign replies to other team members. Manage your conversations inboxes by adding an inbox, deleting an inbox, managing team members, or setting up a Slack integration. If you have a Sales Hub or Service Hub Professional or Enterprise account, you can create multiple inboxes (up to 100). 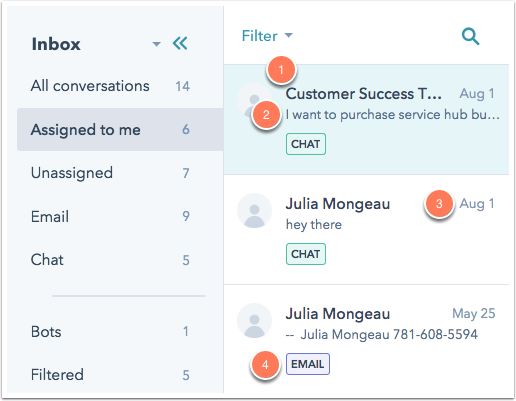 Setting up multiple inboxes allows different teams to manage their customer interactions separately. For example, you could set up an inbox for your sales team, an inbox for your customer success team, and an inbox for your billing team. Please note: only users with Admin access in your account can add a new inbox or delete an existing inbox. In the left sidebar menu, navigate to Conversations > Inboxes. In the upper right, click Create inbox. Give your team inbox a name. 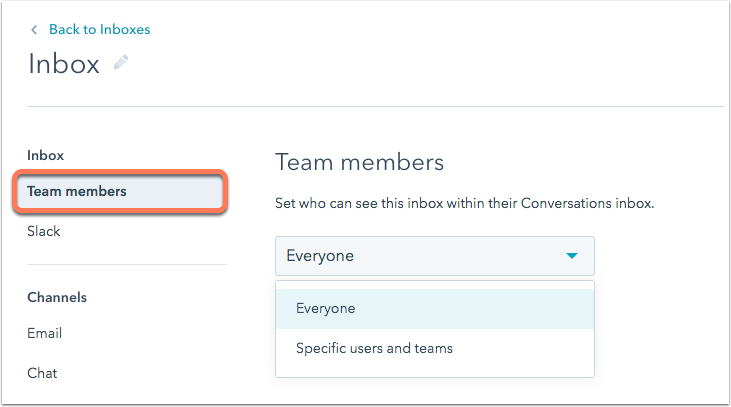 To specify which team members can access this inbox, click the Team members dropdown menu. Users will only be able to view and interact with the inboxes they have access to. While setting up your inbox, you can connect a team email channel or a chat channel. Or, click Connect a channel later. 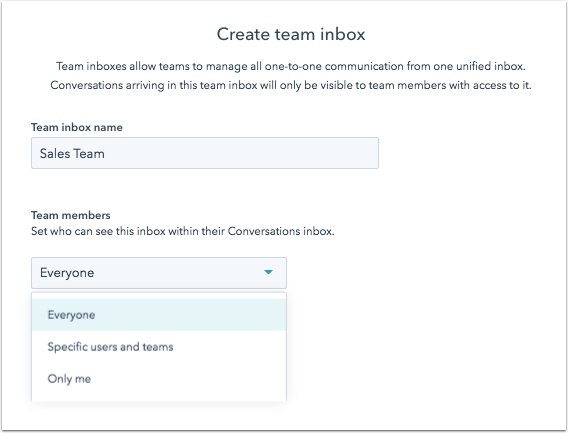 Once the inbox is created, team members can manage communication specific to their role in the appropriate inbox. Hover over an inbox name and click Delete. In the dialog box, type in the name of your inbox to confirm this action, then click Yes, delete. Please note: deleting an inbox will permanently remove it from your account along with any email channels, chat targeted messages, and conversation threads. This action can't be undone. Hover over an inbox name and click Edit. In the left sidebar menu, select Team members. To specify which team members can access this inbox, click the dropdown menu. A user needs to be added to your team to send an email from that conversations inbox. In the left sidebar menu, select Slack. 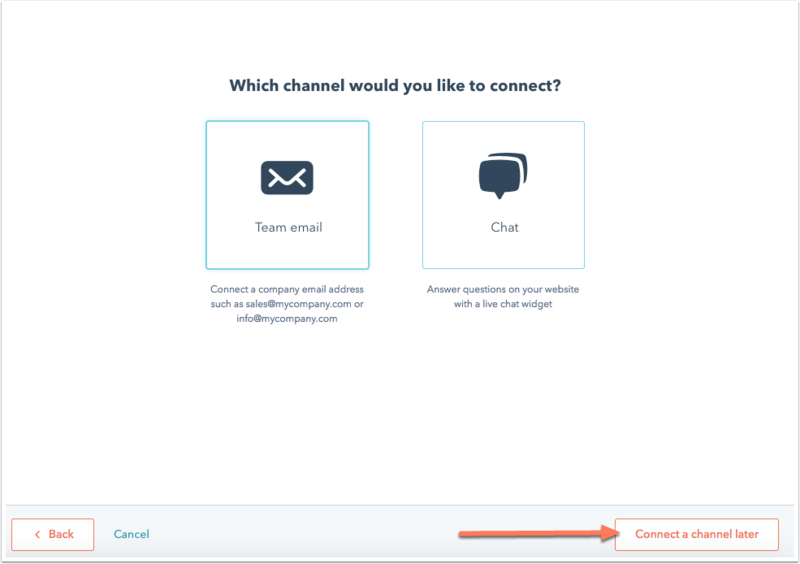 Here, you can connect a Slack account or manage your existing integrated channels.